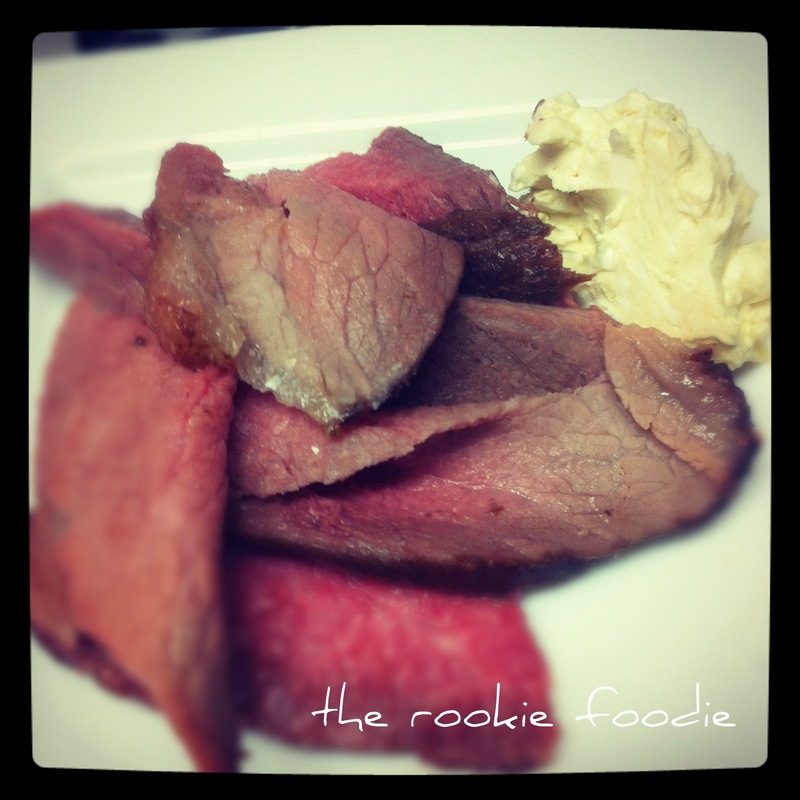 The Rookie Foodie shows us how to make Eye of Round with Horseradish Cream. Hi all! I am dealing with lots of family issues at the moment and there are some fabulous bloggers who will be dropping by to help keep The V Spot running. My dear friend Connie from The Rookie Foodie (and also from the hilarious The Young And The Relentless) is here today to share her recipe for Eye of Round with Horseradish Cream. I’ve been trying to be good and eat little to no gluten. It’s been tough! I should have never had the gluten free for all that was December. Getting back on track has been a little bit easier with a couple great recipes that I’ve found recently. I recommend using a Programmable Probe Thermometer . You can also find them at Target with the kitchen gadgets. The original recipe said to leave in the turned off oven for 2 hours….but because I was using the thermometer, I knew my roast was ready after only 35 minutes. Combine the cream cheese, horseradish and mustard. Stir until smooth, cover and chill. Combine wine and butter in large bowl or a zip lock bag. Add the roast. Cover the bowl with a lid or saran wrap and chill for 24 hours, turning occasionally. Remove roast from the marinade and discard the marinade. Place the roast in a foil lined 13 X 9 pan. Combine the salt, pepper and garlic powder in bowl, then rub on the roast. Bake uncovered at 500 degrees for 20-30 minutes. Turn the oven off and do not open the door until your roast reaches 145 degrees (for medium rare) or 160 degrees (for medium). This can take up to 2 hours but my roast only took 35 minutes. Thinly slice meat, reserving pan juices and serve with horseradish cream. Connie (aka The Rookie Foodie) is a stay-at-home-mom and future PTA President. When she’s not trying new recipes or looking for cool coffee shops in Denver, she’s chasing her kids around the playground. You can find her on twitter @rookiefoodie or Google+. Thanks Connie! I hope you will all go over and visit her. Connie – that is WAY to sophisticated for me. I love Connie. She has GREAT recipes. YUM! I never in a million years would have thought to make this!!! Hi! I’m a brand new blogger who loves your blog and your style. I know timing is bad for you right now but when you have a moment I would be honored if you would check out my blog and give any input as I blogchug along. Prayers to your family.